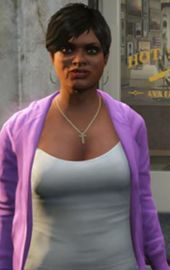 Donna is a character in the HD Universe who appears as a minor character in Grand Theft Auto V.
Donna is, in 2013, the main employee of the Herr Kutz barber salon chain in San Andreas and the Hair on Hawick barber salon in Hawick, Los Santos. She injures a number of people while working and wears contact lenses (suffering from myopia (shortsighted), which she suggests had led to a number of problems, and also warns gangsters that she is 'the one with the blade'. New contact lenses - fingers crossed they do the trick! Major shakes after last night - hope nobody ask for a shave! Remember gangsters, when you come in here, I'm the one with the blade. This page was last modified on 6 February 2014, at 20:45.